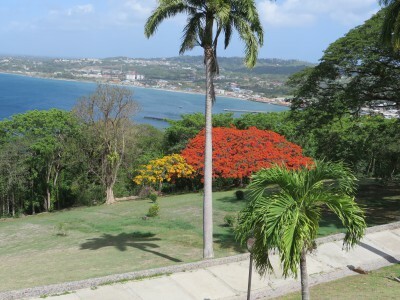 If you thought Trinidad sounded like a Caribbean paradise, just wait til you see Tobago! With hotels named Coco Reef and Crown Point and glass bottom boats with names like Cool Runnings, you know you’re in the right place for a great time. I had an idea of what to expect in Trinidad, but being in Tobago was like going to a whole other country – in the best possible way. Talk about “true island life” – this was something I could get used to. Yeah, I could get used to this. For our trip to Tobago, I was getting the full experience: take one of the big ferries over to Tobago on Sunday morning and fly back to Trinidad on Caribbean Air for our return on Thursday afternoon. Unfortunately for us that meant getting up a wee bit early (i.e. 5:30 AM) to make the 8:30 ferry – apparently you have to be there really early to get a good seat. 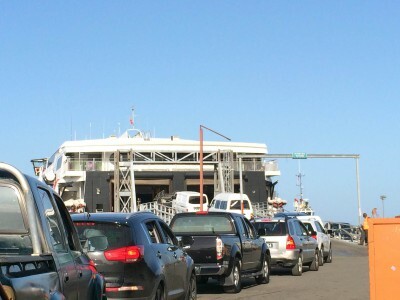 The ferries going between Trinidad and Tobago are pretty damn cool though – they’re huge, double-decker deals and some can even carry cars and trucks in their hulls. That’s impressive. We were riding one of these behemoths, so I snapped some pics of cars going into the hold before we boarded and settled ourselves on the top floor for the 3.5 hour boat ride over to Tobago. This is just a fraction of the line of cars waiting to board the ferry. Sean, his mom Suzette and I were riding the ferry Sunday and his sister, her son and her boyfriend had come over the day before by plane for a long weekend. It was a good thing too, as the boat ride over was rough and a good amount of people got sea sick (Sean’s nephew Ethan would have been among them if he’d been with us). Luckily, we three were fine. Once we landed, I was struck by how tropical Tobago is compared to Trinidad. There are no high rises, no major industry (oil, natural gas, etc.) and it seems about as laid back as you could possibly get. We got a car to our hotel, Grafton Beach, which is right off of Grafton Bay (obviously), and it was perfect. The hotel is right on the beach (which was almost completely empty the whole time we were there), it had a big pool, an open air lobby with a bar and the restaurant was an open-air affair overlooking the ocean. We had two hotel rooms next to each other and as soon as we’d checked in and dropped off our bags, we went over to where Chervon was staying and all went for a late lunch in town, which consists of one main road on Tobago within walking distance of Store Bay and Pigeon Point (Tobago’s two most famous beaches). A shot of the pool deck at Grafton. Not bad, huh? A view of the pool from the open-air lobby. Chef’s BBQ was the choice for lunch and it was a fine choice. They had everything you could expect for proper Trini food: macaroni pie, potato pie, BBQ chicken, mixed vege, bake, fry bake, buljol (salt fish), fried plantains, etc. I’m sure I’m leaving a bunch out, but suffice it to say, no one walked away hungry or unhappy. After lunch we all went back to the Grafton Hotel and Sean and I hung out in the covered lobby that had lots of couches and a good breeze while Chervon, Ethan and Michael went in the ocean and the pool until dark. It was on that day that I truly started feeling relaxed. The next day we spent the morning by the hotel pool then went into town to see the beaches of Pigeon Point. Lunch was a stop at Royal Castle (Trinidad’s much better equivalent of KFC) and then we entered the park, which is quite possibly the most beautiful stretch of beach I have ever seen. White sand, serene blue waters, little pieces of coral washed up on the beach from the reefs nearby – truly stunning. We all floated around in the water soaking up the fresh salt air until we were pruney before calling it a day. And each day we were in Tobago ended the same way: sitting outside with a good breeze blowing, reading, chatting and generally enjoying the fact that there was really nothing more to do than that. It was so nice. Here’s the pier off of Pigeon Point. So picturesque. One of the other glass bottom boats in Store Harbor alongside ours. 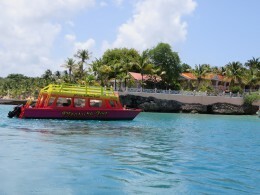 On Tuesday, Sean and I took a glass bottom boat tour (Frankie Boat Tours) of Buccoo Reef and the famed Nylon Pools. It was amazing!! Not only did we drift over living reefs full of colorful fish like parrot fish and French angel fish, but we actually got to snorkel with them too. I loved it! Being just inches from all these gorgeous fish and reefs was just amazing, and the Nylon Pool and a little spit of land called, No Man’s Land afterwards was equally cool. 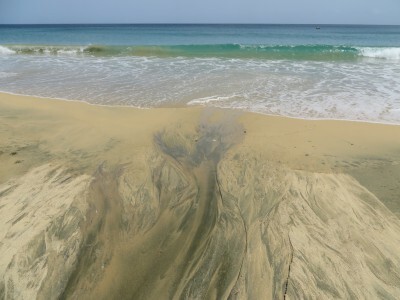 The Nylon Pool is an in-sea shallow white ground coral pool that was named by Princess Margaret, and the ground coral is supposed to be really good for exfoliating your skin. Since the water was only waist-deep, everyone was hopping out and floating around or rubbing the coral on each other for smoother skin. 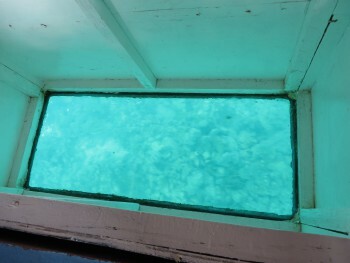 A shot of Buccoo Reef through the glass windows in the center of our glass bottom boat. By the time we got back from the tour, which had left a little after 11 AM, Sean and I were starving and had had all the sun our delicate, pale skin could take. I had done ok with the sunscreen, but hadn’t even thought about how the backs of my legs would fare was I was snorkeling around. We stopped in town at a little restaurant called skewers for some Mediterranean food to take back to the hotel. Just as we were digging into lunch with his mom, the Brazil vs. Germany World Cup game came on TV and we got to enjoy that massive defeat by Germany while eating some good grilled chicken, hummus and roasted potatoes. 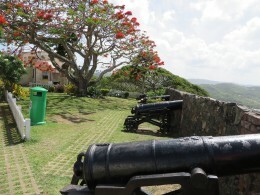 Wednesday was more lounging time around the pool and down on Grafton Beach, but in addition to that, I was taken to see Fort George, the biggest, surviving fort on the island of Tobago. It was impressive how well it’s still intact after 200+ years and we got some nice pictures up there with cannons several hundred years old. 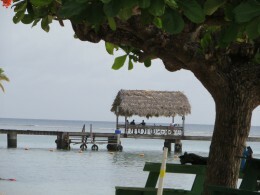 Sadly, Thursday was the day we had to come back from Tobago, but we got a few extra hours there by accident. Apparently, Caribbean Airlines had been having some personnel issues with its pilots striking for higher wages, and the day we were due to come back our flight was delayed from afternoon to evening due to one of these hiccups. I don’t know many details except that we landed quite a few hours later than expected. 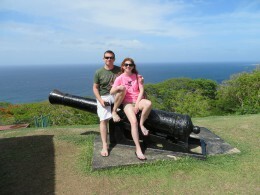 Sean and I on a cannon. I don’t think this was their original intent, but it made a good photo op. It’s remarkable how well Fort George has weathered being built over 200 years ago. By the time we left the airport, it was dinnertime so we stopped at the local Chinese place, Fat Su’s (no joke about the name) and Sean got his beloved char sui pork, plus pepper shrimp, roast pork and noodles, fried wontons and wonton soup for everyone to share at home. Delicious after the long afternoon we’d had. 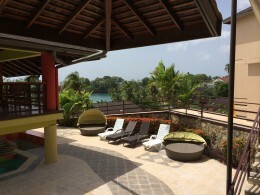 After being in Tobago, it’s easy to see why Sean loves it as much as he does. That little island is amazing and absolutely the most relaxing place I’ve even been. 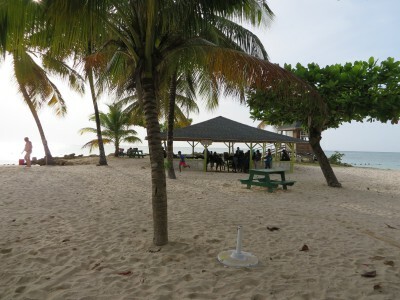 If you’ve ever had trouble unwinding, come here – there is truly nothing to do but go to the beach and chill. Way down in the distance you can see the port where we arrived by ferry in Tobago. Great view. 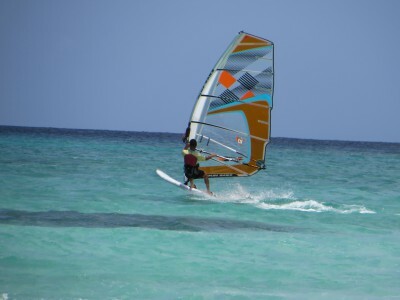 An especially nice shot of a windsurfer Sean took while we were on the boat to Buccoo Reef. The vacation was more than halfway over, but stay tuned for my next blog post, there was no way we were leaving Trinidad without a bang and a truly epic send off! I really liked how the sand looked here. 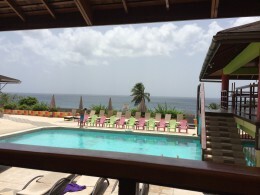 This entry was posted in Caribbean, North America and tagged Boat, Buccoo Reef, Caribbean, Ferry, Fort George, Glass Bottom Boat, North America, Nylon Pools, Pigeon Point, Store Bay, Tobago, Travels, Trinidad, Trinidad and Tobago on August 6, 2014 by Paige N.. Perfect!! Glad you had a lovely time and if you are in the mood for the frenzy come back for Carnival!